Dolores is Jerry's girlfriend in "The Junior Mint". 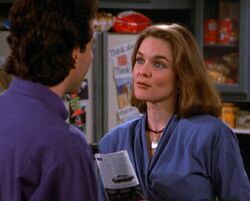 In the episode, Jerry is dating this attractive woman whose name he cannot remember, though she told him her name rhymes with a part of the female anatomy. He spends the episode avoiding the use of her name, and trying to find ways to ascertain it, including digging in her purse and having his friends stop by, hoping she will introduce herself. Jerry and George try to guess the name, with choices of Bovary, Mulva, Loreola, Celeste, Hest and Gipple. She finally realizes Jerry doesn't know her name, and breaks up with him, leaving his apartment in a huff. Jerry then suddenly remembers her name, and calls out to her from his window, "Dolores!" Dolores also plays a minor role in "The Foundation", where she sees Jerry on the street, recalls his recent engagement, and when he reveals that it didn't work out, requests that they go out sometime. The "mystery woman" was played by Susan Walters.